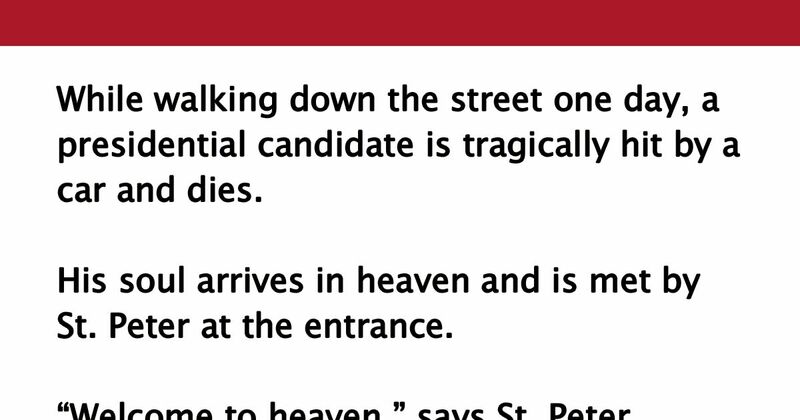 While walking down the street one day, a presidential candidate is tragically hit by a car and dies. “Really? I’ve made up my mind. I want to be in heaven,” says the politician. The doors open and he finds himself in the middle of a green golf course. In the distance is a clubhouse, and standing in front of it are all his friends and other politicians who had worked with him. Everyone is very happy and in evening dress. They run to greet him, shake his hand, and reminisce about the good times they had getting rich at the expense of the people. They then dine on lobster, caviar and the finest Champagne. Also present is the devil, who really is a very friendly guy and who is having a good time dancing and telling jokes. They are all having such a good time that before the politician realizes it, it is time to go. So, 24 hours pass with the politician joining a group of contented souls, moving from cloud to cloud, playing the harp and singing. They have a good time and, before he realizes it, the 24 hours have gone by and St. Peter returns. Now the doors of the elevator open and he’s in the middle of a barren land covered with waste and garbage. He sees all his friends, dressed in rags, picking up the trash and putting it in black bags as more trash falls to the ground. Ouch! SHARE this joke with your friends if you enjoyed it!